My new small space coffee bar. 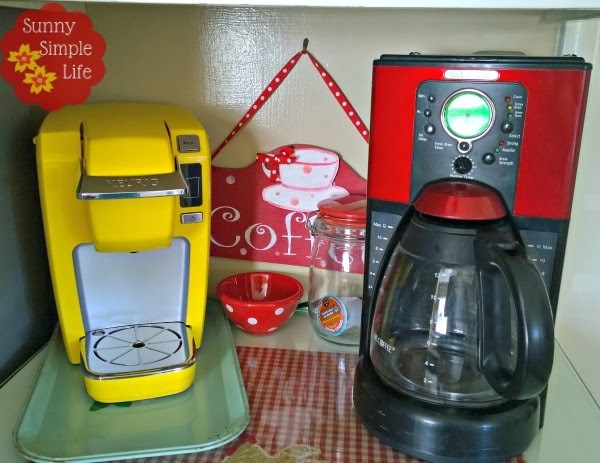 Still in my clearing counters mode, I have moved our coffee makers to a spot that previously had a land line phone but we thought would be great for a coffee bar. We would always pile papers up here, well no more cause coffee is king and has taken over this spot. My little wooden coffee sign needs some adjusting but we love it here. There is a drawer below that I have emptied and will store filters and extra K-cups in along with other coffee bar supplies. My cabinet now houses some of the vintage items from my white shelf that is now my farmhouse pantry shelves. The counter top here already had a glass top so perfect for moisture protection. Makes me happy every time I stand and wait for my morning coffee to brew. Very cute, just love all the colors! What a perfect spot for a coffee bar!!! 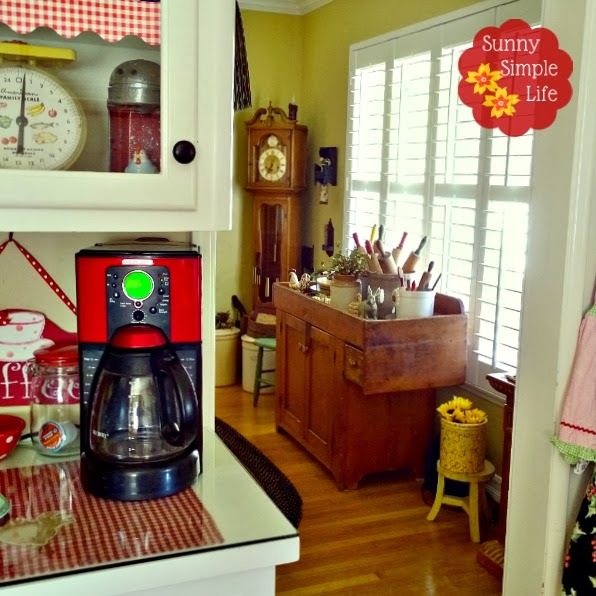 I love the red pot and yellow Keurig!!! Have a great day. Though of you the other day as we were at Azusa Pacific College. Drove through Glendora and part of where you live. Miss you. Hope to see you soon. I love your color choices. I'll bring chocolate chip cookies and have a cup with you! 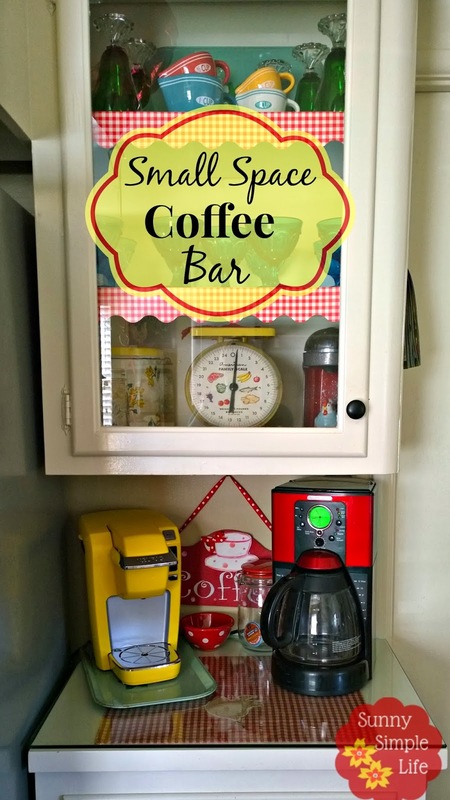 I have no space for a coffee bar, but I can still envy you your cute space. I love there Elaine. It makes perfect sense and I love how you arranged the cupboard on top! Perfect spot and I love the little coffee sign!!! Perfect! I love having one spot for all the coffee stuff. It makes it so convenient. Can I ask where you got the gingham shelf liner? I love it! Doesn't having a coffee command center just start your day off perfectly. I see you are guilty of having both types of coffee makers too. I just can't turn loose of my old-school coffee pot. One of these days I'm sure I will. What a sweet coffee bar! It would have to be a tea bar in my house though :) I hope you're doing well! Maybe you could take ribbon off your sign and put a picture hanger on the back so you could hang it up higher? I love the color. FUN! So cute, love the bright colors!